One of the advantages of the Hoover Power Scrub Deluxe Carpet Washer FH50150 is that it comes with a two-tank clean/dirty water system. These short videos (under 1 min each) show how the tanks are filled and emptied. On reason the Hoover Carpet Basics Power Scrub FH50150 is so popular is the ease of use of its two-tank water system. This machine has been designed such that the clean and dirty water tanks fits well and snaps in place smoothly. If you are interested, there are also videos that explain the features and how to use the Hoover Power Scrub Deluxe carpet cleaner cleaner. Video Synopsis: This video demonstrates how to fill the clean water tank. It begins with safety tips on turning off the Power Scrub Deluxe carpet cleaner and unplugging it. The presenter shows users how to remove the tank from the carpet washer. The detergent compartment was filled with detergent solution (Hoover Clean Plus 2x), followed by warm tap water at the sink. The video also demonstrates snapping the tank in place and making sure the tank is aligned. 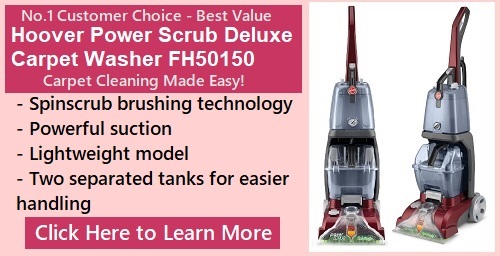 From the video, viewers can see that the Hoover Power Scrub Deluxe FH50150 has really good workmanship – the tank snapped into place quite effortlessly. Still, it’s a good idea to pay attention and make sure the tank is securely in place. Video Synopsis: The dirty water tank can be emptied at any time. Should the dirty water tank be completely full, a shut-off valve will shut off the suction mechanism. Before emptying the tank, users need to turn off the Hoover Power Scrub Deluxe Carpet Washer and unplug the power cord. Viewers can see how the latch below the tank is released and how to lift the tank by its handle. The tank can be emptied at the sink or drain. As an aside (from our experience, not from the video), users with really dirty water tanks may want to empty it at the drain or into the toilet, rather than the sink. If there is a lot of pet hair, dirt and debris mixed into the water, it may clogged the sink. The video also demonstrates how to put the dirty water tank back in place in the carpet cleaner after the tank has been emptied. Visit the Hoover Power Scrub Deluxe Carpet Washer FH50150 Review to learn more about it.